BISHKEK (24.kg news agency) – At the beginning of 2015 the resident population of Kyrgyzstan amounts to 5.8 mln people. Rimma Chynybaeva added that the process of demographic aging doesn’t affect Kyrgyzstan and unlike many of the CIS countries, demographic situation in Kyrgyzstan in 2014 was characterized by population growth, which amounted to the national average of 2.1%. According to the UN classification, the population considered elderly if the proportion of people aged over 65 in the total population is more than 7%. “At the beginning of 2015 4.3% of Kyrgyzs are registered in the above age, that is, the process of demographic aging doesn’t currently affect the country”, she explained. 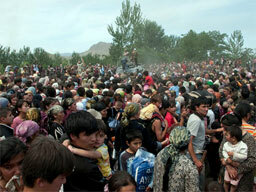 On 24 March 1999 Kyrgyzstan carried out its First National Population Census as a sovereign state. This census revealed that the resident population was 4,822,900 persons. This census gathered information about Kyrgyzstan’s population that was crucial to develop government forecasts on socio-economic development, to enumerate the size and composition of the population, to study location and use of labour resources, and to conduct scientific research. The country is rural: only about one-third of Kyrgyzstan’s population live in urban areas. The average population density is 29 people per km².